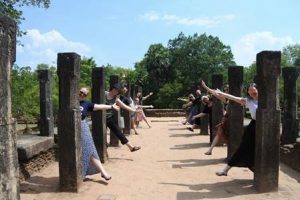 On The Go Tours (OTG) recently hosted a group of agents to experience their Wild About Sri Lanka 10 day tour . Nearly a decade on from the end of its civil war, Sri Lanka is a travel destination that is on the rise globally. Over the last year, On The Go has seen a growth on Sri Lanka tours by 40% and in the month of September, this spiked up to 88%. Australia’s interest has also been supported by increased airline capacity and accessibility to the region including the announcement of a direct flight from Melbourne to Colombo in October 2017 with SriLankan Airlines. The group was hosted by OTG’s Kat Nitarski and included agents from Flight Centre Queensland. Over the ten-day itinerary starting in Colombo, the group visited Dambulla Rock Temple, a stunning complex of 5 caves which contains over 150 images of Buddha and took a scenic train trip through verdant tea plantations to Nuwara Eliya where a significant share of the world’s best tea is produced. Other highlights included 3 game drives across Udawalawe, Yala and Bandula National Parks where a high concentration of Asian elephants’ roam and depending on your luck, chances to see sloth bears, golden palm civets, Sri Lankan krait, crocodiles and leopards. The Wild About Sri Lanka 10 Day Tour is one of OTG’s signature ranges with the group staying in 4-5 star accommodation and heritage properties.